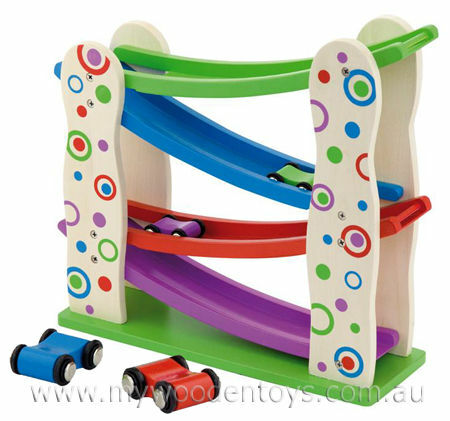 Wooden Zig Zag Car Slider is a fascinating toy with four little cars that run down curved race tracks, flip over at the end and rattle all the way to the bottom. The cars are a lovely purple, blue, green and red and the natural wooden frame is decorated with lovely dots and circles in matching colors. This is a great co-ordination and tracking toy as you try to get all the cars running one after the other... enormous fun! Material: Wood with Child Safe Paint. Cars have metal axles. We like this because: "So much fun to do again and again and again and again... and then you can do it again,"